The first person to congratulate Tom Brady after taking a knee to seal victory in the AFC championship game on Sunday was referee Clete Blakeman, who patted the Pats quarterback on the left shoulder pad before quickly exiting the field. Not a teammate. Or even a player on the Jacksonville Jaguars, the opposing team. But a man whose job is to objectively observe the game and ensure its integrity. Blakeman’s apparent fanboy behavior is one of the many pieces of “evidence” NFL truthers are pointing to today to support their claim that Sunday’s game was fixed for the Patriots, and that the league is brazenly corrupt. NFL truthers have been ranting online for years that the league fixes games to maximize its profit — elevating certain stars and teams to achieve the highest entertainment value, and converting it to television and merchandise revenue. But the chicanery that took place in yesterday’s AFC championship game was particularly egregious, they say. 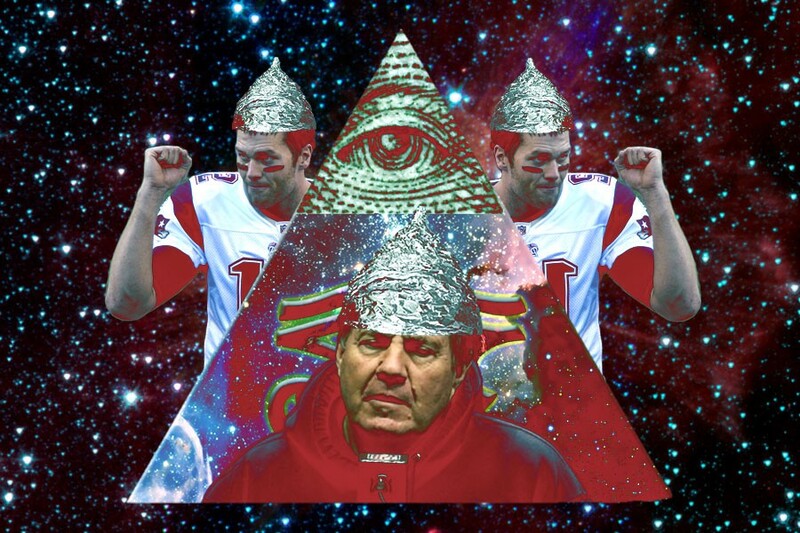 “All I can say is look at the officiating,” says Brian Tuohy, the world’s pre-eminent NFL conspiracy theorist. Indeed, there was a 9-to-1 penalty discrepancy in the game in the Patriots’ favor. Of the nine penalties called against Jacksonville, two were for defensive pass interference — an anomaly considering Jacksonville was called for defensive pass interference just five times over the course of the 16-game regular season, the least in the league. Jaguars defensive back A.J. Bouye was called for pass interference late in the first on what appears to be perfect coverage, for example. The Patriots scored a touchdown two plays later, regaining some much-needed momentum before halftime. There were a handful of other calls that went against Jacksonville — including referees not calling pass interference on the Patriots on two controversial plays in the second half, and referees calling Jacksonville linebacker Myles Jack down by contact after stripping Patriots running back Dion Lewis in the third quarter. Had he not been ruled down, Jack would’ve almost certainly returned the ball for a touchdown, making a Patriots comeback very unlikely. “How fortunate can one team get before it gets openly questioned?” says Tuohy. The calls, he argues, were all part of a coordinated effort to ensure Tom Brady and the Patriots made their eighth Super Bowl appearance together (the most by any player in NFL history). The NFL has seen a decline in TV ratings this year — although it’s unclear if those losses have been offset by streaming — and the corresponding perception that its cultural influence is waning. A Super Bowl featuring the league’s most famous, most marketable player, and the league’s most infamous team is sure to help fix that perception, so naturally the league instructed its officials to guarantee a Patriots win. Tuohy — who wrote the book The Fix Is In about corruption in professional sports, and maintains a blog of the same name — says penalties are one of the NFL’s primary methods for manipulating the outcomes of games. Because referees are the ultimate authority in a game, and because most of their decisions are judgment calls anyway, the deception can occur right before your eyes, in plain view. San Diego Reader columnist and veteran sportswriter Don Bauder noticed a member of the chain crew at yesterday’s AFC championship grinning widely as it became clear the Patriots were going to win. And many other viewers at home noticed the referees seemingly cheering alongside the Patriots at the end of the game. Bauder isn’t convinced the Pats-Jags game was fixed, but he agrees that referees are the mechanism by which the NFL alters the outcome of games — not because NFL owners tell them to, but because some referees have been bribed by professional gamblers. NFL players and coaches make too much money to risk getting caught up in a gambling scandal, but referees earn a little less than $200,000 per year, making them more susceptible to bribery. Funny thing is, I'm not really a conspiracy theorist. But the NFL is fixed. There's a reason when I was a kid like every other Superbowl was a blowout and now every one comes down to the last minute. Blong goes as far to say that NFL games are scripted, “like soap operas,” and that that information is then passed on to professional gamblers who shift their lines accordingly. “Vegas seems to consistently win — about 70 percent of the time, I’d say — which makes me think there must be something rotten and it ain’t in Denmark; it’s right here in the USA,” Blong writes in his most recent email blast. But the majority of these allegations are purely speculative. That won’t stop some people from believing the NFL is impure.